Busy weekend...technology director webinar was on Friday evening, GT certification class on Saturday, grading papers/lesson planning and a girl scout meeting on Sunday afternoon. Whew...where did the weekend go? Hence, the late night post! 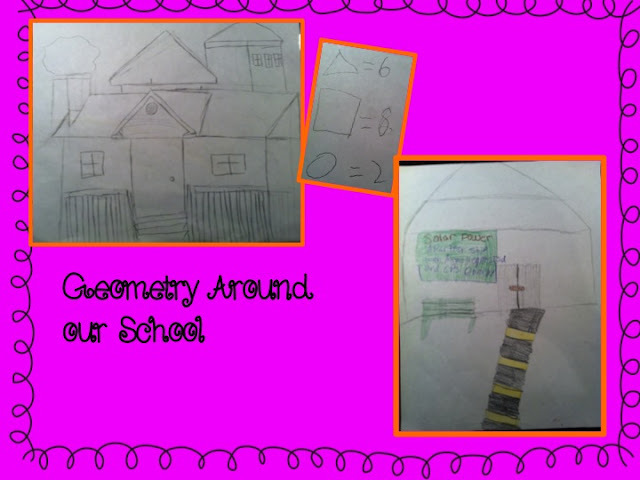 Anyway, I had my students grab their colored pencils, a pencil and clipboard and to the front of the school we dashed! I don't think they really believed me when I said we were heading outside to look for geometry. 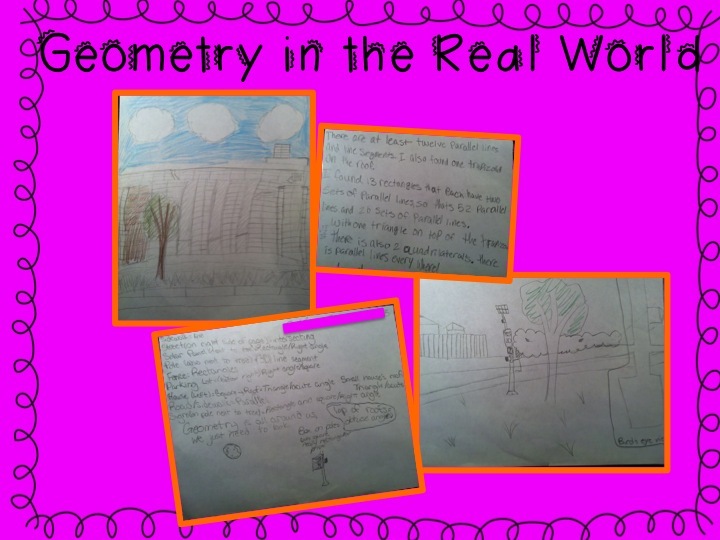 Once outside, the students I had my students spread out and face a direction that geometrically "called" to them. They drew/colored for about 15 minutes. Then they flipped their paper over and wrote about the geometry that they saw. It was a great informal assessment! The top one is a drawing from my student from Taiwan. Our school uses Words Their Way for word study...spelling. 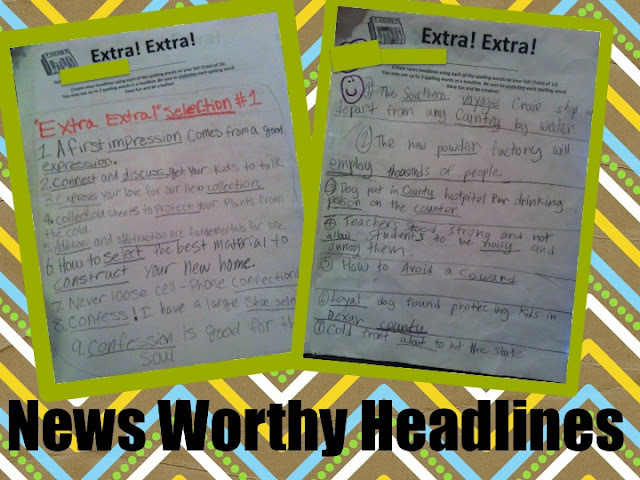 This week I had my students use their word list to create news headlines. A few things to tweak with this assignment. My directions were to vague and even though we talk about titles ALL THE TIME, they still didn't capitalize the major words. We talk about it when we make a science notebook entry, math entry, free write in our journal, and ohh I don't know...all the time! Apparently, they aren't transferring the skill to their own writing. Any suggestions out there? One thing I did, was change was the original assignment. 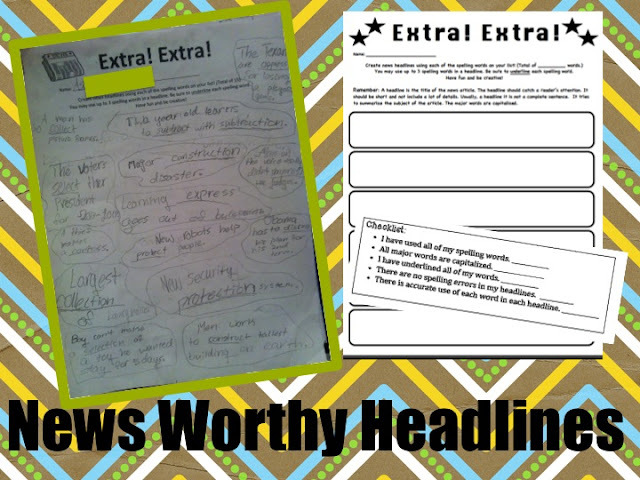 I posted the new and improved activity sheet on TpT. Fun Freebie! 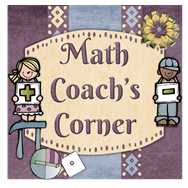 Monday, I'm joining Donna over at Math Coach's Corner for a book study. I got my Teach Like a Pirate book on Saturday! Wahoo!